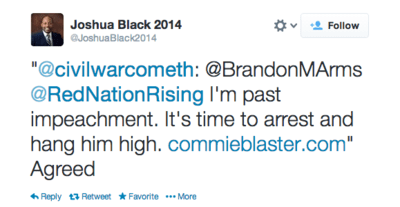 This is getting a lot more attention than it otherwise might because the tweeter, Joshua Black, is currently running for a seat in the Florida House of Representatives. Let's get a couple of things out of the way up front. One, it is true that Black did not originate the comment in question. He was retweeting someone else's comment. Given the way he retweeted it, it's not that easy to tell who was the original source, but it really doesn't matter, either, because Black not only retweeted it, he added the word "Agreed." A retweet is not necessarily an endorsement, but saying "agreed" does seem to settle the issue of whether he agreed with the original comment. As for the comment itself, which, again, he adopted, Black has defended it by saying that he believes Obama should die because he has committed treason, for example when he ordered drone strikes that killed U.S. citizens overseas. "He should be executed for treason," Black said. "I think the appropriate punishment is death. They killed Benedict Arnold. [Obama] shouldn't be allowed to kill Americans without a trial." This is mostly, but not entirely, wrong. First, death is, technically at least, an appropriate punishment for treason. 18 U.S.C. § 2381. Not the only one, but the statute authorizes it. So far, batting a thousand. Second, he is right, and I wholeheartedly agree, that a president should not be allowed to kill Americans without a trial. I have in fact repeatedly yammered on about my personal belief that it should be illegal, let's say, for the government to blow up a U.S. citizen who has not been charged with, let alone convicted of, any crime, and without so much as getting a warrant. See, e.g., "The Drone Memo: More Comedy About the Death of Freedom" (Feb 6, 2013) (and posts linked therein). I actually think it's kind of important that it not be allowed to do that. So there's that too. But consistent with that belief, I also think this should apply to Americans who happen to be president. Here is where Black starts to go a little astray. Because there are actually a number of steps between "arrest" and "hang him high," one of which is the "trial" that Black thinks is important. In fact, there is an additional step when the president is involved, called "impeachment." The Constitution is not 100% clear on this, but strongly implies that a president must be removed from office by impeachment before actually being prosecuted, and impeachment involves a trial. U.S. Const. art. I, §§ 2-3; art. II, § 4. So when you say you are "past impeachment" and want to move directly to the arrest-and-hanging part, that is a problem for one who also wishes to be seen as upholding the right to due process. Third, what Black is accusing the president of is not treason. "Treason" is actually defined in the Constitution itself, and in fact it's the only crime defined there (showing the drafters were concerned about overusing the term). U.S. Const. art. III, § 3. "Treason against the United States, shall consist only in levying War against them, or in adhering to their Enemies, giving them Aid and Comfort." Blowing up your own citizens doesn't involve any "enemies," and "levying war" seems to mean just that—getting a bunch of armed dudes together and trying to overthrow the government. (This is apparently why Justice Marshall refused to charge Aaron Burr with treason although he was clearly up to no good. U.S. v. Burr, 25 F. Cas. 201 (C.C. Va. 1807).) So killing a citizen without due process isn't treason. It's just murder. Finally, nobody killed Benedict Arnold. He switched sides, fought for the British, eventually moved to London, and kicked the bucket there due to natural causes in 1801. So c'mon, man, get your facts straight when calling for the execution of the president. Interestingly, Black says on his campaign website that in his view, "Republicans have a serious communication problem." If they do, he probably isn't the guy to fix it.